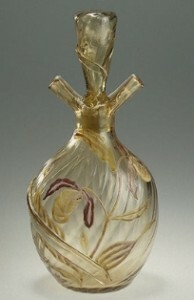 The earliest Galle vases were made of transparent clear or colored glass, and were enameled. The colors were usually soft, such as honey, or his own creation, clair-de-lune (a pale sapphire produced by adding potassium and cobalt oxide to the glass). A number of transparent crystal vases were carved in intaglio and then polished to simulate rock crystal. Galle went on using clear glass from time to time, frequently in conjunction with wheel-carved designs involving figurative subjects, then in conjunction with internal decoration and external enameling.